As found by the current Planet Express crew (4ACV12). 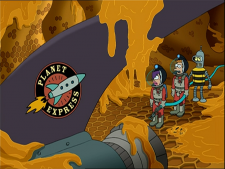 The old Planet Express ship was the ship used by the old crew. It was presumably designed and built by Prof. Farnsworth, and currently rests in the Space Hive, where the current crew discovered it to have crashed and be submerged by honey (4ACV12). Its color appears to be "Electric Mucus", only less colorful, though this might be a result of the fate it suffered. The ship resembles the current Planet Express ship, as it would be expected. Fry: [He looks up and sees a ship caked in honey. It has a familiar logo on the tail.] Oh, my God! The old Planet Express ship. Man: [On tape.] Captain, the bees have us surrounded! Oh, the Professor was right. We're not as good as his old crew! Captain: [On tape.] Well, I aim to prove him wrong. It'll take more than a few deadly, deadly bees to-- [The buzzing gets louder. Screaming:.] Oh, Lord! Leela: [More screams are heard, and switches the tape off.] Uh, couldn't make that out. Too much static. This page was last edited on 5 August 2013, at 21:34.